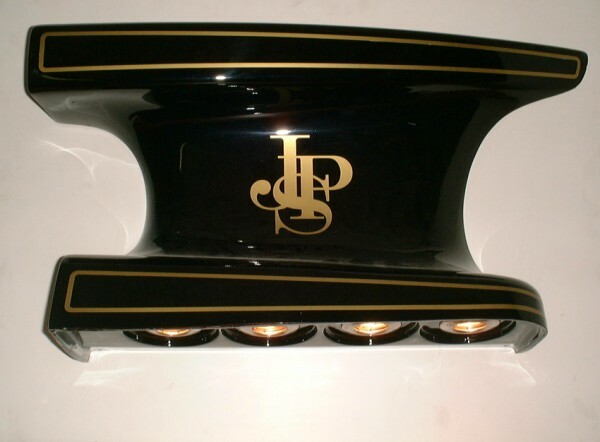 "Lampe Lotus Type 72 Airbox Downlighter"
Airbox Downlighter von Ayrton Senna's Type 72, das ist mehr als nur ein Lampe. Das ist ein gutes Stück Rennsportgeschichte die leuchtet. für viele Motorsport- Enthusiasten geworden. In our travels around the world of historic Motorsport we find that the Lotus type 72 is the car that is most recognizable above all others.The wedge shape, the black and gold livery and six seasons of World Championship competition make it the favourite Lotus for many Motorsport enthusiasts. The anvil style airbox is an icon for the type 72 and it occurred to us that it would make an impressive piece of memorabilia. Using a mould taken from the airbox of 72/5 (the greatest of all the type 72 chassis) we have created half sections that are perfect for displaying on the wall. In the midst of admiring our handiwork it dawned on us that we could take it a step further and install downlights in the inlet trumpet holes; splendid! However you might choose to use the airbox is up to you, but please let us know if you come up with anything else that is similarly cunning. Weiterführende Links zu "Lampe Lotus Type 72 Airbox Downlighter"